When you have problems like that, you can always google the dll. I added it to the zip file nonetheless. I may add an import feature for texts but that's not my priority at all. Sorry for the missing dll. EDIT : there were more than 1 missing dll... I'm re-uploading the thing. 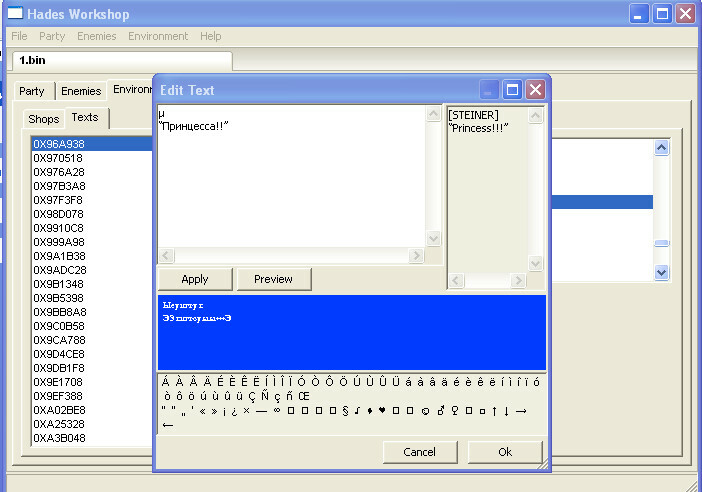 Thanks Work very well, but when I Overwrite binari file the program crash and alsot the text are limited, but there is a method to edit freely, I say in the matter of adding many characteres as you want? OBS: it's hard to know how to move in a program of this size, just as it is a great game franchise like Final Fantasy IX, good luck on your project. Ultimately, I guess that might be possible, but no one ever succeeded to do a thing like that on an ISO for what I know. The problem is that adding more characters means "pushing" the datas in the file and it doesn't like it. Fortunatly, there is an extra space empty and unused after the text dialogs (it varies between 0 and 2048 extra characters for one text block). So I can use that space. The only cautious is that I don't know exactly everything about how dialogs are encoded and I just need to do some tests to get it working well. I'm not planning on pushing the limit more than that. Also, keep in mind that a lot of the texts in a text block isn't actually used (dialogs from CD X but present in CD Y, debug dialogs, etc...). I can't reproduce the "overwrite save datas" bug. Does it happen even if you only edit a spell's power? Or is it related to text? Did it re-scanned the file? The .hwf should be updated. If that's the problem, just delete the .hwf file and let the program redo one. Anyway, I'll try to be a bit faster on the next version, so everything can work properly. Note that if you try to put unrecognized characters in texts (since there is a filter, the only way to do it now is to copy/paste them), the program will no longer crash on saves but instead turn those characters into "?". you can change the font to Arial. there is also Latin and Greek, and Cyrillic? I'm waiting for the updated version, that can handle more text in dialogue boxes. - Font of the text editor switched to "Arial". EDIT : Forgot to tell you that, if you can write lengthened texts, the text boxes' won't be resized accordingly, so you can't put anything you want either. To change the box sizes, I guess it'll need to edit the scripts. That's on my to-do list but it's quiet a huge work (I'm a bit experienced on it by now, but I need to make the program read .ppf first). Actually, I changed my mind. I won't do a .ppf reader but I'll add a way to save changes in a custom format. It will allow you to pass changes from a disc to another, for instance. - You may now export the additional changes you made as a PPF. to the file in your hard disc + the things you edited. That's why you have to apply the undo patch before exporting as a PPF, so the file in your hard disc be the initial game file. But this is a temporary trick. I mean I hope that next version you won't need it anymore. Great, thanks for the effort man. looking forward to the custom file export feature. I tried to translate FF9 in Asian language (Thai language) with Hades Workshop. But it is always change to . I think it is because there are no alphabets in char table. 1. I don't know how to add/replace it into char table with hex edit tool. 2. I don't know how to use char table from QwimmWiki to find the position of char table. Can you advise me to do this. 4) You end up with texts in-game full of "? ", as well as when you close/reopen the file using HW. Are all these points right? 1) I have English version of ff9. 2) It open perfectly fine in English language. 3) Yes, I did that. Also, how many different characters would you need, approximately? less than 200? more than 600? They are less than 80 characters. Here is the alphabets in Unicode for your reference. Thai number is not important. Whatever it can or can't add Thai alphabets. I appreciate with your concern. Thanks. Tirlititi is it possible to replace "Change" into any other command list instead? Yeah, I know, I need more investigations on commands, but since dialogs was most asked, I went for it first. Editing the "Change" spell also makes strange results : it seems to apply both the "change row" effect and another effect you would put. Btw Gine, I found where a charmap is being defined from an image (that draws the characters). I had trouble reading images but Zidane_2 succeeded there, so I guess it may be possible in a relatively near future to use a custom charmap made from an image you'd import. - Added unknown flags in spell datas (if you figure out what's their purpose, I'm interested ^^ I guess some of them are about counter-attacks). - Re-added the extra texts in battle. About sharing datas across different CD for enemy and text datas : as you may display it, each battle and text block as an ID (identifier). The program simply uses that ID to identify the battles. I had a lot of bugs with saving and opening .hws files at some point and I'm unsure I fixed all of them. You may got fatal errors or less important bugs... I'll release a bug-fix version soon if that is the case.